Hello there and thank you for stopping by today. Today is the third day of the MFT May Release Countdown. Only 3 days until the new release (yay)! Be sure to head over to the MFT Blog for full set and die reveals for the day. 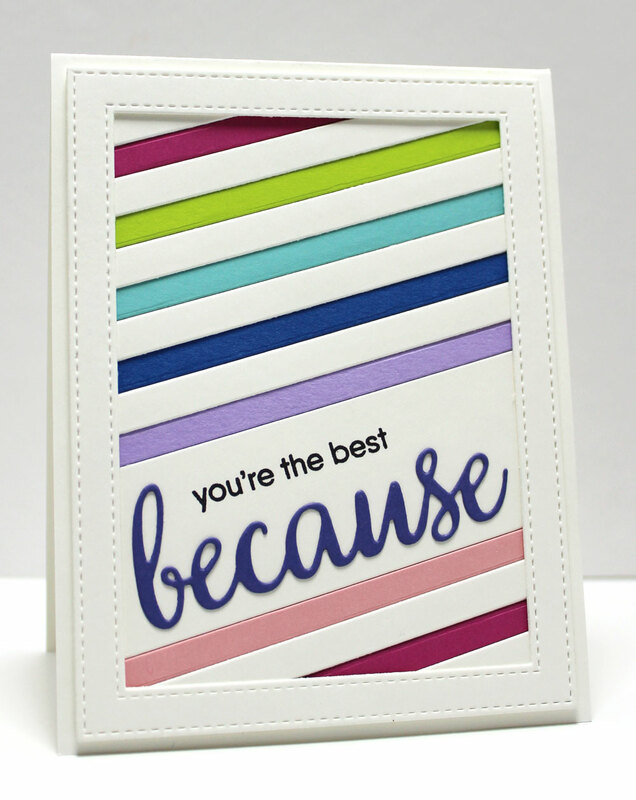 My card today features the gorgeous new Diagonal Sentiment Strip Cover-Up. I love the platform on which to build your sentiment, and the new Because You stamp set and included Die-namics are the perfect fit! I framed the card with my single most favorite product MFT carries: the Stitched Rectangle Frames. These products and many more will be available for purchase in just 3 days, on May 3 at 10 PM EST. Be sure to check out the MFT Blog to see what the rest of the team has come up with today. A nice simple card is what I love. The detail is gorgeous! The dimension is so beautiful, love the color choice of papers! What a useful and versatile diagonal sentiment die! your card looks so clean, I love it! Cute card. Love the new cover-up dies. What a fun, colorful card.